A new partnership helps connect students and educators to some of our country’s lesser-known national park resources, and become stronger writers in the process. The National Park Service’s Cris Constantine wouldn’t blame a teenager for being bored on tours at historic sites. Yet when a group of high school students from the Philadelphia Writing Project recently visited Independence Hall—the site where both the Constitution and the Declaration of Independence were adopted—the students were anything but. Learning about the colonists’ struggle for representation and independence from Britain, the students immediately drew parallels to their own lives, said Constantine, who is the education program manager for the National Park Service’s Northeast Region. Some students were able to connect the colonialist history to the present-day Black Lives Matter movement, for example, as well as to their own adolescent struggles to feel independent. This work is part of a national movement to help Americans, and young people specifically, make their own personal connections to public lands. The National Park Service turns 100 this August, and has launched a campaign to help all Americans “find their park.” This work includes educational outreach and the Every Kid in a Park initiative, which is providing free passes to national parks to every 4th grader (and their families) this year. Constantine says she’s seen firsthand how educators can enrich a history curriculum by asking students to grapple with real ideas based in historical record. Asking students to explore the meaning of independence in their own lives, for example, when studying the Declaration of Independence, can result in deeper learning that students are more personally connected to. The teenagers in Philadelphia are part of a growing partnership between the National Park Service (NPS) and the National Writing Project (NWP) designed to bolster learning opportunities within the national parks and reach more young visitors and educators. The two organizations are working on projects at 10 national park sites—many of which are not actually parks at all, but national historic sites. The collaborations look different from site to site, and serve different age groups, but each uses a historical park as a platform for place-based, hands-on learning. The activities differ, but all partnerships involve writing or digital literacy exercises inspired by historical events, usually incorporating the park’s resources. Students in Philadelphia, for example, write their own “declarations” (for gun control, say), grapple with big questions like “What does freedom look like?” and learn how to “read” the portraits hanging on the walls at Independence Hall. They share their writing on a blog at the National Park Service website where they can comment on their classmates’ work. “We’ve seen students walk away and say: My voice matters,” she said. The alternative, taking students on a guided tour and then testing their knowledge, is, according to Constantine, “very 20th century,” and less impactful. “We’re really trying to foster that sense of inquiry and questioning, so students can approach the primary sources and uncover some of the untold stories not readily apparent at first glance,” said Mary Buckelew, director of the Pennsylvania Writing and Literature Project, which partners with the Valley Forge National Historical Park, in an NWP Radio broadcast. The park hosts a two-week reading and writing summer camp for Elementary school students each summer, where students watch historical reenactments and read original documents about African-American soldiers and Native Americans in the Revolutionary War. And they aren’t just reading printouts of these resources at their desks. 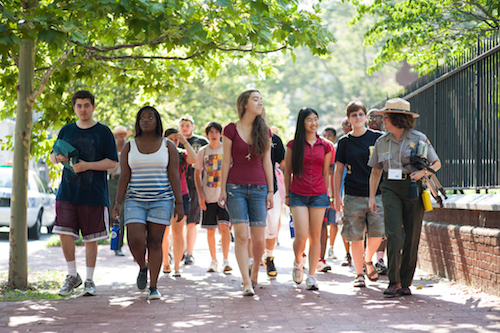 “The park experience gives students the opportunity to have an authentic learning experience as they step onto a historical land or in the footsteps of historical figures,” said Suzanne Norris, park ranger at the Roosevelt-Vanderbilt National Historic Sites in New York, which partners with the Hudson Valley Writing Project to host a summer writing camp for middle school students. “The greatest accomplishment for me is helping the students realize they can have a voice through writing.” She recalled one student’s short story about FDR, told from the perspective of a tree on the land. Some of the Northeast partnerships focus on students, but many also offer robust professional development opportunities for educators, to help them develop place-based curriculums that make use of local historical resources. Constantine said the benefit is mutual. She and her colleagues too often develop educational programming without the benefit of educator partnerships. Now, they have access to teachers’ perspectives and NWP resources. The NPS facilitated a week-long session during last summer’s Connected Learning Massive Open Online Collaboration (CLMOOC), a summer professional development program for educators. The idea for the NPS week was to inspire teachers to find learning opportunities outside the classroom. In one activity, participants created a Google map of parks, museums, monuments, and other opportunities for learning in their own communities. Constantine said she learned as much as she taught. “When you open up and let other people in to play with your content and contribute something, you see your resources in a different light.” she said. For example? “It’s okay to put googly eyes on Ben Franklin,” she said.